I’ve created 2 Ansible Roles (chilcano.apache-nifi and chilcano.apache-nifi-toolkit) to automate the creation of a multi-node and secure NiFi cluster. 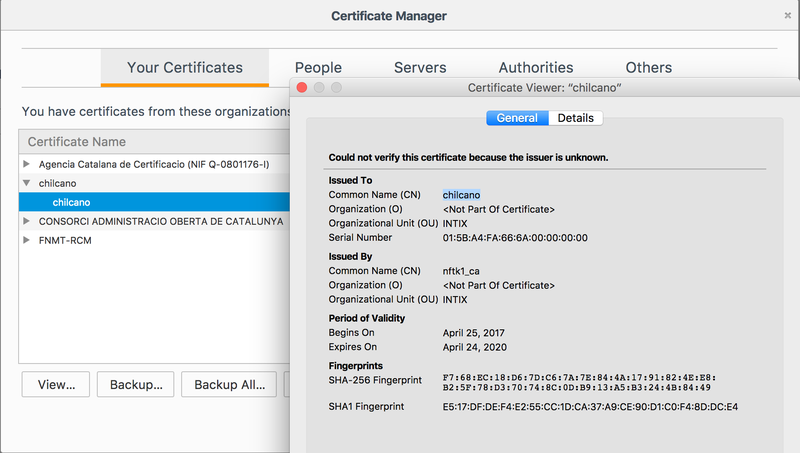 At the moment, the chilcano.apache-nifi Ansible Role doesn’t implement Cluster State coordination through Apache ZooKeeper. It will be implemented in the next version of this Ansible Role. For other side, I’ve implemented only TLS Toolkit Standalone mode in the chilcano.apache-nifi-toolkit Ansible Role. We are going to create 5 NiFi instances, the first NiFi instance nf1 will be a standalone instance running over HTTP. The second instance will will be a customized instance running over HTTPS with Client Certificate authentication. Create all 6 VMs by using Vagrant. Now, I’m going to provision (run Ansible Playbooks) through Vagrant. 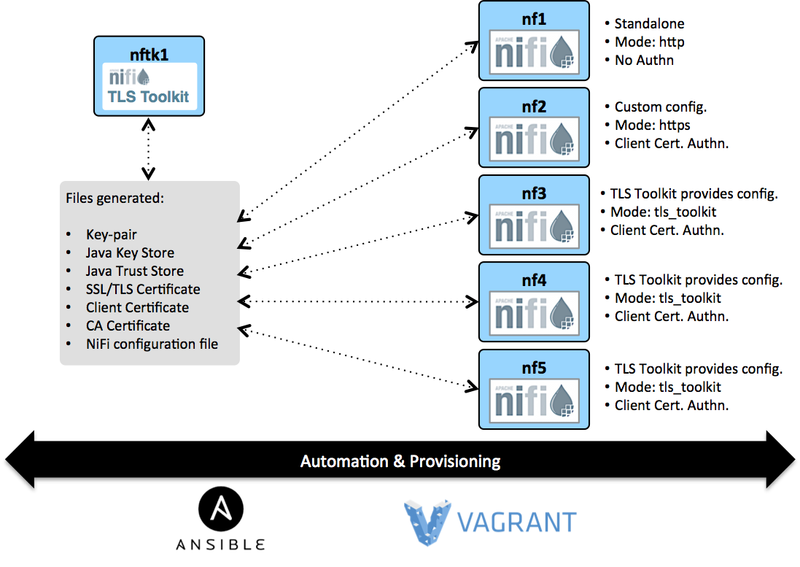 This step will install Apache NiFi TLS Toolkit in the nftk1 VM, once provisioned, Vagrant will provision 5 VMs following the Ansible Playbook playbooks/main.yml. It is very important to start the provision of all NiFi instances after provisioning nftk1. In the playbooks/main.yml you will see the nftk1 is declared on top and after nf1, nf2, nf3, nf4 and nf5. 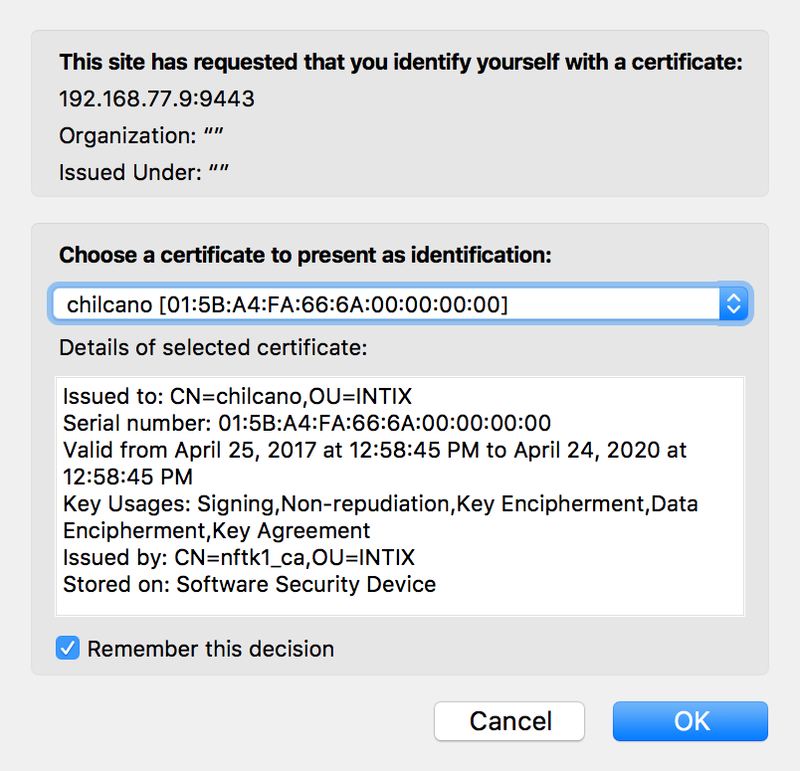 Now we can verify if all instances are running as expected, before we have to install the Client Certificate (CN=chilcano_OU=INTIX.p12) generated in our browser. 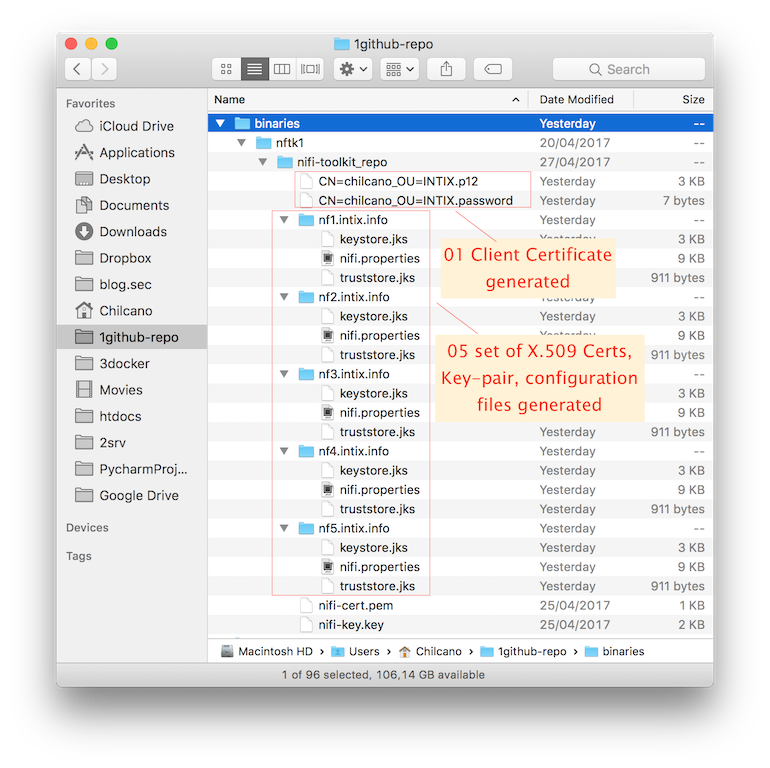 The Client Certificate only is required when connecting to nf2, nf3, nf4 and nf5 because these instances are running over HTTPS with Mutual SSL/TLS Authentication (based on Client Certificate). Open the URL (http://nf1:8080/nifi, http://nf2:9443/nifi, http://nf3:9443/nifi, http://nf4:9443/nifi and http://nf5:9443/nifi) from Firefox. Instead of hostname you can use the IP address (see inventory file). Improve the Ansible Role chilcano.apache-nifi to implement Cluster Status coordination through Apache ZooKeeper. 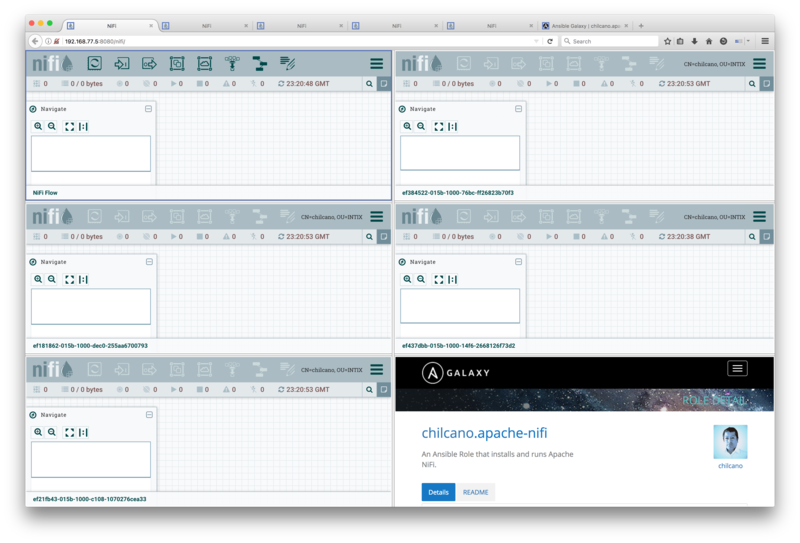 Improve the Ansible Role chilcano.apache-nifi-toolkit to implement Client/Server mode. Deploy a sample DataFlow in NiFi.